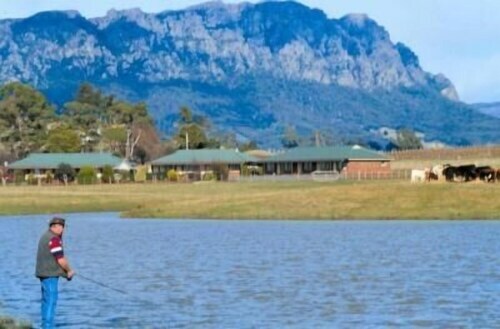 A municipality on the Meander River of Tasmania, Deloraine is predominantly a farming town perfect for tourists because of its great culture and location. A perfect spot to explore the surrounding region, find a Deloraine hotel and come to visit one Australia's craftiest towns. The charm of this riverside village lies in the carefully restored Georgian and Victorian buildings. Take a walk through the city centre and be amazed at the bridge, Bonney's Inn and the Baptist Tabernacle - just a few of the many historical landmarks in Deloraine. Grab one of Tasmania's famous scallop pies, and enjoy delights from bakeries that have won national awards. Every November the town swells to almost 30,000 people (there are only 2000 residents), for Australia's biggest working crafts fair. Over four days more than 200 exhibitors allow you to see firsthand many of the final products being made. Take a workshop and learn candlewicking, or watch experts craft kaleidoscopes and silkscreen paintings right before your eyes. Visitors that can't make it for the fair can still check out many displays at the galleries in town. The 41 Degrees South Salmon Farm and neighbouring Ginseng Farm are both successful ecotourism businesses. Take a relaxing walk through both wetlands and woodlands. Learn about ginseng, explore the fish farm and keep a sharp eye open for platypus near the creeks on the nature trail. Mole Creek National Park is a great afternoon, head in and discover Liffey Falls or watch Tasmanian Devils being fed at Trowunna Wildlife Park. Christmas Hills Raspberry Farm is notorious for its delicious desserts, and stop by The Honey Farm for a taste of Tasmania's unique leatherwood honey. 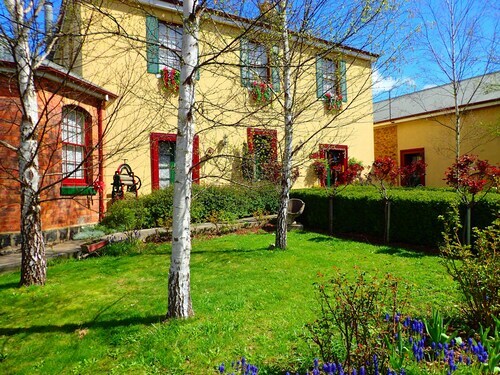 50 kilometres west of Launceston, Deloraine is a unique town full of local charm. Book your Deloraine hotel and stay right in the centre, giving you a fantastic spot to enjoy the delights in the local region. Why not visit on your next holiday? How Much is a Hotel Room in Deloraine? Hotels in Deloraine start at AU$89 per night. Prices and availability subject to change. Additional terms may apply. This property is located in the heart of the town. I booked a single room with shared facilities. The room was excellent, being clean and modern. The shared bathroom was immaculate and never an issue to get use of it. Yhe common loungeroom was well eqipped. The staff were friendly and helpful. Parking was just at tge back of the property. I have no hesitation in recommending this hotel. Great place to stay - loved the hospitality and the Alpacas!